BUSKER ORGANS & HAND TURNED ORGANS - Music rolls & Music Books for Busker Organs, Street Organs, Fair Organs. For more than 45 years the family run business of Dean Organ Builders have been manufacturing new hand turned mechanical organs here in the UK. We also act as agents for European organ builders selling their street and busker organs from our retail shop "The Music Box Shop" in Whitchurch, Nr.Bristol, England. As a manufacturer of custom built organs we normally have a waiting list for our new instruments. However we realise that customers for the smaller street organs often require an instrument right away and to meet this need we always stock at least one street organ at our retail shop. Stock organs differ from time to time but generally they will be of the 20 note roll playing type, either of our own manufacture or a good quality European manufacturers product. We can supply hand carts to transport the organ and covers for storage if required. As standard the organ will come with one roll of music. We can supply further music rolls from our library and even make custom music if required. This style of organ is perfect for street collection and entertainment or just to have in your home and enjoy. 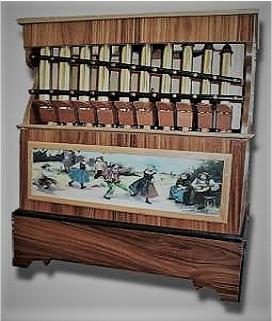 If you are interested in purchasing a small hand cranked organ why not arrange a visit to our shop for a viewing, all we ask is that you pre arrange your visit with us by e mail or telephone to check that a member of staff will be available to demonstrate the hand cranked 20 note street organ for you. 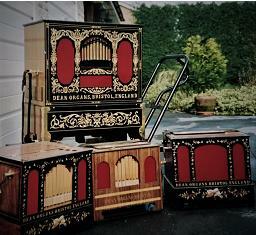 To see the model of street organ we currently have in stock and view its specification please CLICK HERE. We do sometimes take part exchange against new organs, this means that we often have pre owned organs in stock some awaiting repair or restoration. These instruments are available to purchase in "as is" condition as a project for the amateur repairer or we can quote to carry out any necessary repairs / restoration to bring the instrument back in to good playable condition. If required these organs in some instances can be reconfigured and reconditioned to suit a specific purpose or requirement, thus sometimes enabling us to shorten our delivery time over a new instrument. Occasionally it can also be that reconditioning a pre owned organ offers a saving over new price. To browse the available pre owned hand turned street and busker organs that we currently have in stock please CLICK HERE. We cut and supply new perforated music rolls and cardboard book music for hand turned street and busker organs. Click on the links below to view our music lists for the more standard street and busker organ scales, this is not a complete list of the scales we can supply for, hence if your scale is not listed please contact us for a book or roll music list for that particular scale. If you would like a tune made on perforated cardboard book music or for one of the roll scales which is not on our list, please contact us and we will arrange to make it for you (providing it will fit the scale). 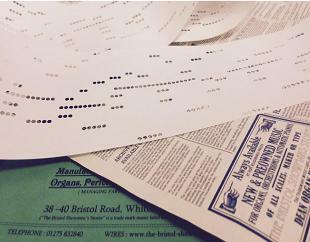 To browse our music list for the standard 20 roll organ scale please CLICK HERE. To browse our music list for the standard 20 book organ roll scale please CLICK HERE. To browse our music list for the 25 (Gasparini, Perlee, Pell) book organ & roll scale please CLICK HERE. To browse our music list for the 32 Prinsen book organ scale please CLICK HERE. To browse our music list for the 36 Verbeeck book organ scale please CLICK HERE. We also sell pre owned music rolls and books which can be a saving against the cost of new. To view our latest stock of pre owned music please click on the link below. To browse our current stock of pre owned music please CLICK HERE.